Since 1914, Union has strived to fulfill one mission: connecting people, and not just via telephone lines. 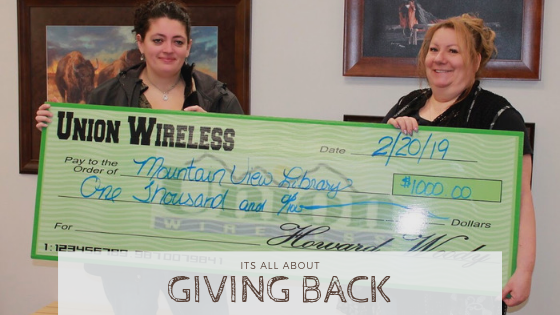 Our Giving Back Program has helped thousands in the Rocky Mountain region. We have helped fight hunger, supported educational programs, and sponsored family uniting events. The summer reading program hosted by the Mountain View library in Uinta County is the latest donation recipient because we recognize that an educated society is a connected society. Libraries are often one of the first places where a child will experience the awe and abundance of knowledge available to them. Despite the onset of digital learning alternatives, libraries remain essential and valuable to our communities—they are a place where people connect. We hope you will join us in supporting all of our local libraries.